When I was a senior in college, my thesis class got into a discussion about propaganda. Most Political Communication majors in D.C. want to grow up to run campaigns and eventually, the White House, so this was an important issue to work through. As someone who hoped to end up on the other side of that press briefing room, it was also a bit depressing. If you’re not sure where you fall on the issue, here’s an example. 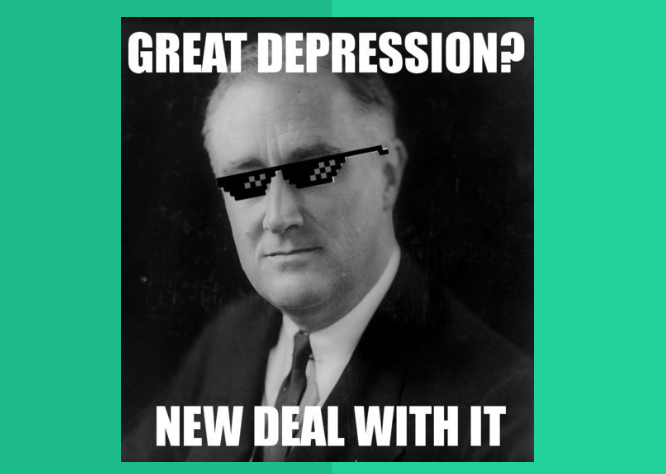 In the 1930s, Franklin Delano Roosevelt created the Farm Security Administration, which gave loans, grants and support to farmers reeling from the Depression and the Dust Bowl. The FSA helped farmers modernize their practices at a time when efficiency was crucial and money to invest in technology was scarce. Rural America was still hit extremely hard, but the FSA went a long way in staving off a complete meltdown. FDR was so proud of this program, he paid photographers to travel the country and document the work of the FSA. The photo project was supposed to “introduce America to Americans” and was run by Roy Stryker, later called an “apostle of the downtrodden.” Thanks to this project, we got the work of Dorothea Lange, Walker Evans and Gordon Parks, as well as a lasting record of the Dust Bowl. That’s so great, right? Great photography documenting great work by the great Americans that make this country great. Who would call that propaganda? People who hated the FSA,that’s who. People who thought that government money was being mis-spent to collectivize farming and turn America into a socialist republic dependent on government handouts. (Your #MakeAmericaGreatAgain is someone else’s #MakeDonaldDrumpfAgain, you know?) Critics of the FSA, and the photography project in particular, capitalized on the organization’s absorption into the Office of War Information during World War II. The OWI actually did create propaganda during the war, but most of the original FSA photographers had left the project by then. UNTIL NOW. Yale University (heard of it?) has put all of the photos into a searchable online database. Propaganda or not, you can now search the photos by geotag or keyword. And it’s awesome. Here are some stand-out photos from the Sistorians’ backyards. Check out all 170,000 photos, and share your coolest finds in the comments! Next Frontier Tears: Could I have made it as a pioneer? I have spent the past hour looking at these pictures – they are so cool! I love the “Salesgirl, fashionably dressed” in downtown Atlanta. Who knows, maybe she bought her fashionable outfit from Rich’s?? Thanks for sharing and contributing to my increasingly distracted Friday at work.